Ok, I know, it is September... please don't jump all over me. And I love the fall holidays and I am not trying to rush things. BUT, yes that is a big but (and you know they don't lie) if you want to make things for Christmas, the time to start is NOW! I know you want to have a stress free holiday season this year. I know you have made it a goal to make more things to decorate your home or as gifts. I know you want to strat early so you can relax and enjoy the season. And with those things that I now, I also know you need to start now. No, really. Seriously. Would I kid you? I have started making things that I won't be showing you until my annual 12 Days of Christmas in November. Sorry...but, I will show you 4 of my favorite past projects that you can make now. You SHOULD make now. Come December you will be happy you do! This very EASY star can be made in under 30 minutes. They make great gifts! NOEL is quick to put together and makes a great impact either indoors or as outdoor decor. A scrap wood stocking holder is great for those who did not have a fireplace. And a simple nativity is a thoughtful gift for someone special. You can get these 4 things made this week or upcoming weekend. Think how good it will feel to get a jump start! You're so right about the need to start early! I know I won't have time to make new decorations when I have Christmas cookies, parties, and gifts on the brain. The time is now! It makes enjoying the swson so much more doable when we aren't stressing making things in December. These are great simple (relatively) projects. I remember seeing your ribbon star now a few years back. Gosh, it's neat. Thanks, yes that ribbon star has made the rounds! I am happy to know I am not the only one making plans for Christmas projects on this Thanksgiving (Canadian) weekend. I enjoyed tea and a pile of Christmas magazines for inspiration last night. 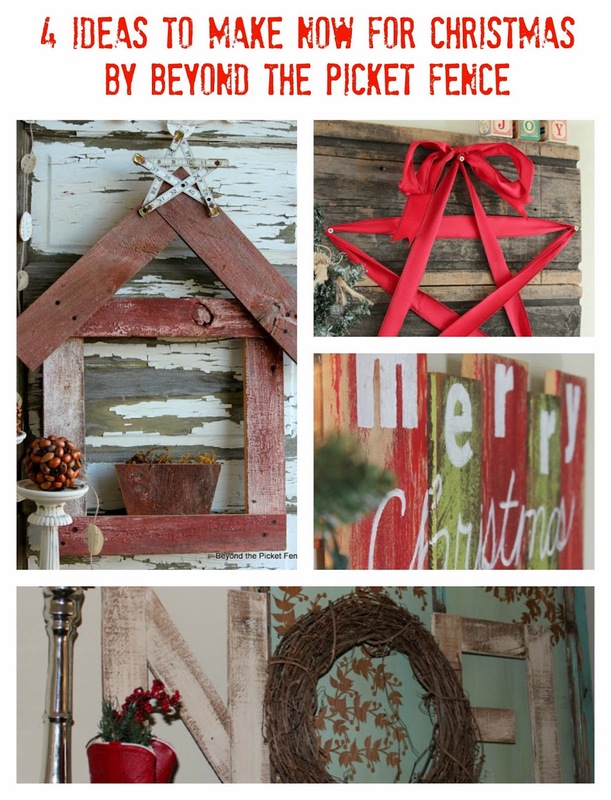 Your barn board ribbon star made my list of must do projects.